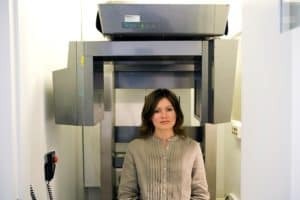 We have instant access to CT-scanning at the clinic, with our on-site miniCAT low-dose conical beam scanner. One study of your sinuses, taken with the miniCAT conical beam CT scanner, exposes you to an amount of radiation equivalent to a skull x-ray. During a scan with the miniCAT, you are exposed to 0.17 milliSieverts of radiation. This is far less than what you are exposed to during a normal CT scan of the brain (2.00 mSv). In fact, this is far less than the average amount of natural background radiation you are exposed to on earth (~3.1 mSv per year). With the miniCAT, your sinus scan only takes 40 seconds. Usually it can be completed at the same time as your consultation with A/Prof Harvey. If you have had multiple radiological studies- eg. X-rays, MRI, or CT-scans- you can calculate your cumulative radiation exposure, and relative risk from this exposure here. Please note this is an external website, and is not associated with Sydney ENT Clinic.